Month after month my search engine results tell me that a remarkable 40% of my site's visitors arrive at OregonPhotos.com because they want to know something about Portland, Oregon's largest city.. So here I give you this night image of Portland under a Harvest Moon, which I call, "Portland Moon Towers." This image is for sale as a Chromira 8x12 custom print, see below. Visible in the image above are two of Portland's most famous skyscrapers: on the left, the Wells Fargo Tower, at 40 stories and 544 ft. high, it is the tallest building in Portland, although some dispute that, saying that if the slope of downtown Portland is factored in, the U.S. Bank Tower is the tallest. On the right is the unusual pyramid top of the 509 ft. KOIN Tower (Channel 6). Portland garners the title of City of Bicycles. I snapped this picture October 2012 from my window seat of an Amtrak train as we passed along the east bank of the Willamette River. That's the U.S. Bank Tower in the background. 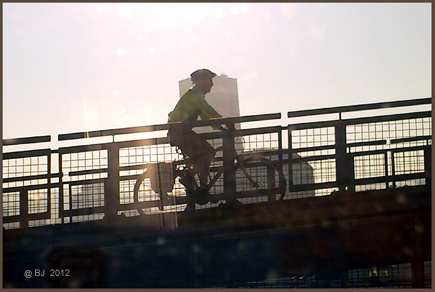 Recent studies report that among the American cities with more than a quarter million people, Portland is tops in the percentage of commuters riding bicycles to work! This is especially admirable in view of Portland's typically cool, wet climate. 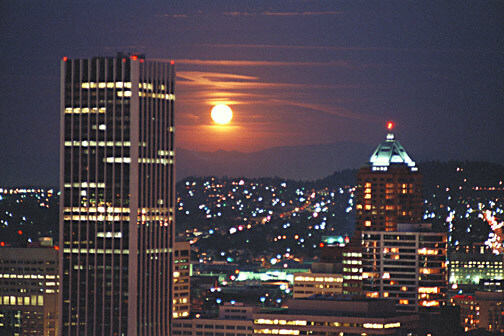 E-mailer (brucej@oregonphotos.com): click for a direct link to communicate with me about ordering "Portland Moon Towers"